Luxembourg, November 2, 2018 - ODYSSEUS Space is the winner of the SpaceResources.lu challenge of the ESA Space Exploration Masters competition that awards the best business ideas for space exploration that also benefit society. The award was handed over in Bilbao, Spain on October 30, 2018 in the frame of the ESA Space For Inspiration conference, an international conference organized by the European Space Agency for everyone curious about space exploration and why it matters. Initiated by the European Space Agency (ESA), the Space Exploration Masters competition targets participants from all around the world. 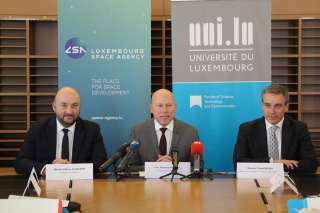 A total of 7 prizes were awarded in collaboration with international partners, including a 500.000 euros prize by the Luxembourg Space Agency.